Everyone reacts to being wronged in their own way. Some grin and bear it, others get aggressive and mean, and some people decide the best solution is to erect an enormous statue of a hand flipping the bird for all to see, as one aggrieved man in Vermont recently did amidst a dispute with town officials. Drivers passing through the town of Westford, Vermont in recent weeks may have noticed an odd sight towering above Route 128 that looked like a large disembodied hand giving the middle finger. And sure enough, that's exactly what it is. The large sculpture, carved from a 700-pound block of pine and and sitting on a pedestal 16 feet in the air, was put up by local resident Ted Pelkey as a not-so-subtle "screw you" to town officials, according to the Burlington Free Press. The reason? Pelkey thinks they're screwing him over by not granting him a long-sought building permit. The bold move is the the latest development in a saga that started about a decade ago, when Pelkey first tried to get a permit to build an 8,000 square-foot garage on his 11-acre property to house his business. Since then, Westford's Development Review Board has repeatedly denied his request for a permit, claiming that his applications have "fallen short of the town's standards," per a report by Boston.com. However, Pelkey insists that they won't grant him approval because they're biased due to personal grudges. This grand gesture is his way of conveying his displeasure with the board. 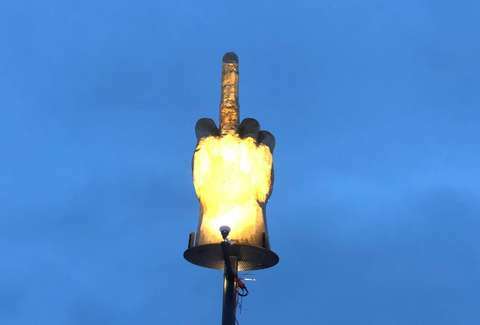 “I was sitting at a bar and said to my wife, ‘Hey, I want to get a statue made of a middle finger, and I’m going to put it up on the lawn,'” Pelkey told Boston.com in an interview. “If you don’t want to look at the building, look at this." Installing the huge, rude hand wasn't cheap. He paid a cool $4,000 to have it commissioned by a local artist, and to ensure people would be able to see it morning, noon, and night, rigged it with a pair of flood lights to keep it illuminated in the dark. Unlike the building permits, the board has no power over Pelkey when it comes to the vaguely vulgar sculpture. It's on his property, and doesn't technically break any laws. In fact, it actually falls into the category of public art. "The Pelkeys can do what they like to exercise their free speech within the laws and regulations," said Allison Hope, chair of the Westford Selectboard in an interview with the Free Press. To be clear, Pelkey is adamant that the sculpture is intended to insult only the people on the board with whom he takes issue, and not anyone else in the town, which has a population of around 2,000. As for how this may all come to a resolution, Pelkey's permit appeal could be heard as early as January. Though even if he does manage to get his building plans approved, there's no telling if it'll convince him to take down the big flipping bird.